I've seen questions and answers that have a picture directly in the text, instead of merely a link to the picture. How do you do this? I see someone has already given you the clickety-click solution. If you prefer typing, like me, then use CTRL-G. That pops up a dialog that lets you give the system a pathname to a image file. That image will be uploaded to the image hosting site SE uses, and the appropriate HTML linking to it inserted into your post. Unfortunately, after the CTRL-G there is still some unavoidable clickety-clicking. I'm honored to think I might be able to help you! Pictures were, and sometimes still are, one of the hardest things about SE for me. J. Musser and Niall C. at Gardening and Landscaping spent countless hours and tremendous patience teaching me, so I take no credit at all. Olin's excellent answer added to Kevin's may now have given you all you need. When I first learned, I only had an iPad, which doesn't have CTRL keys, so I just learned that shortcut today! I don't speak "formatting" so I've had to be spoon-fed. The only way I know how to teach is from the beginning, so please don't take it personally if I act like you don't know anything. Obviously you do! I'm the "dummy" here :) ! 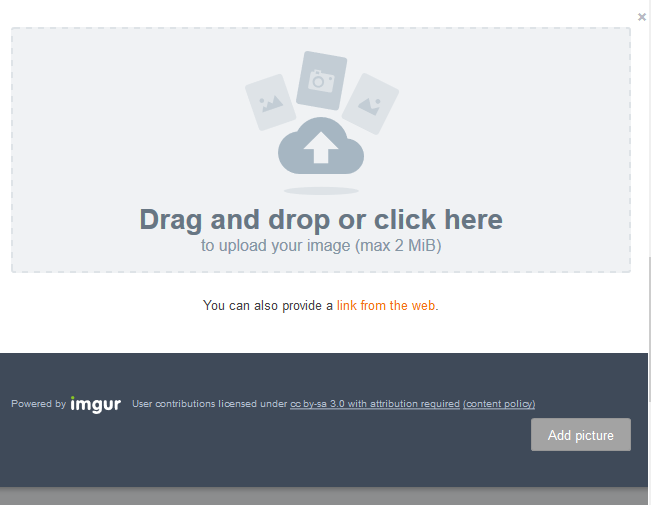 If you want to post a picture from your computer, double click on the big box, and your picture file will open. Either drag and drop or double click the one you want. You'll see a preview of it in the box. If you don't like it, cancel and choose a different one. If you're happy with it, click "Add picture" and it will pop right in. In that box you can type in the url (website address) where the picture is. You can also find the picture/image you'd like, highlight and copy the website address, then paste it into the box. There's no preview option here, but since you can always delete or change anything before posting, there's no problem adding it. Although Kevin's formatting instructions are correct, the system has added something awesome. Now, when you post your picture, instead of starting with an exclamation point, it starts with a bracket, and ends with small boxes side by side with a number in each. What that means is that the picture is linked to a copy of itself, which opens in a separate window. Press on either of the pictures I've posted here to see it work. There are other ways to post images, using HTML to control things like size ratios. The markdown help page explains some of that, but it's pretty much over my head! I can teach you the very basics of re-sizing, though, or show you lots of examples at GL, including some of my own. You can learn a lot yourself by using edit to open any post that has images. You'll get to see the different ways they were posted, and what the formatting looks like. Then just cancel the edit.